I haven’t made this in ages! I made it last week and it was so, so good. Just had to share. When I google “tallarnee” I find weird stuff like foreign language references, Indian removal records, and “layer tick boxes”. But – when I google “tallarnee recipe” google changes the spelling to “tallarni recipe” and pulls up a bunch of hits with casseroles similar to my own recipe. 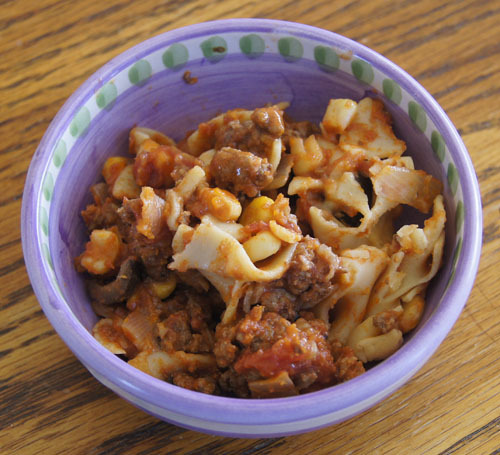 It’s a casserole with noodles, hamburger, corn, olives, onions, tomato soup and cheese. I am keeping my spelling: tallarnee. I found this recipe in my recipe box behind my recipe for “Tetrazini crepes” (another miss-spell, as it turns out). Tallarnee is a great comfort food type casserole that many of us baby-boomers remember from childhood. 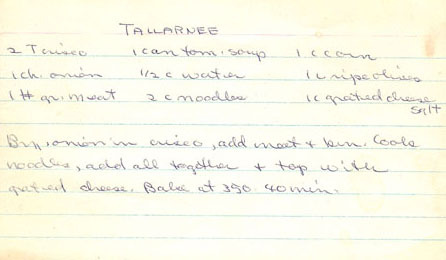 My recipe for Tallarnee is handwritten by me on a 3×5-inch card. That means I copied it from my mother’s collection in the late 1970s or so. When I made it this week, I cut the ingredients in about half for the two of us, and we had leftovers. I used olive oil to cook the onions instead of Crisco. 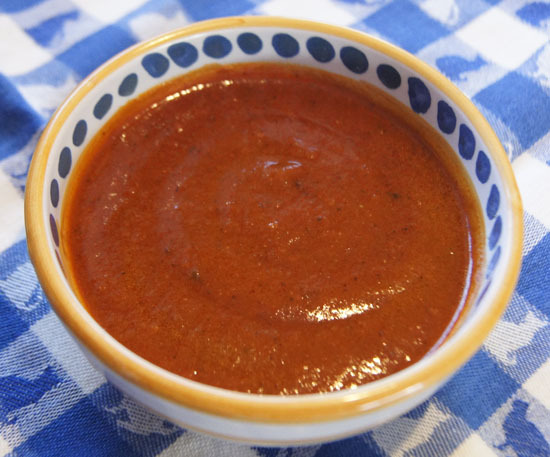 For the tomato soup and water, I used some really good “tomato bisque” that I found at a local store. The above type of soup does not call for dilution with water, so I eliminated water from my old recipe for Tallarnee. If you use the undiluted kind of tomato soup, do add water. Cook the onion in the oil until soft. Add the ground beef and cook until the meat is brown. Cook the noodles as the meat and onion cook. Mix together everything except the cheese and put in a suitable sized casserole or baking dish. Top with the cheese. Bake at 350˚ for 35-40 minutes, until all is bubbly and the cheese is melted. 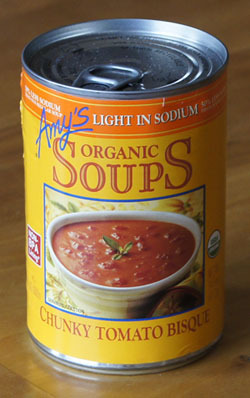 I liked the chunky tomato bisque soup that I used. 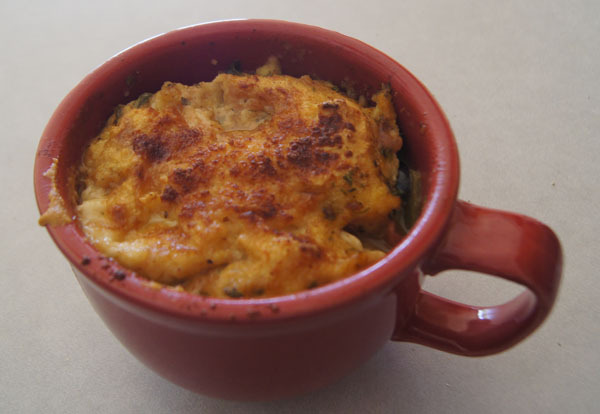 It gave great flavor, while keeping the comfort-food-ness of this casserole from my childhood. I think there is more to explore along these soup-lines to nudge a few more old casserole recipes into the twenty-first century. 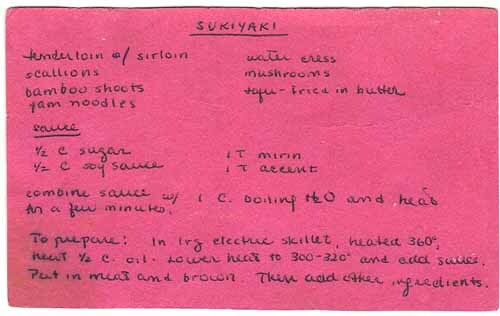 One of my college roommates was Japanese, and she wrote out this recipe for Sukiyaki for me: When we cooked in our on-campus apartment, we made this in my electric fry pan. She was a very neat person (I, on the other hand, can tend to be slovenly) and put neat little piles of the different ingredients – meat, veggies, tofu, noodles – in different sections of the pan. I always loved this meal. And the memories of our times together, including visits to her aunt’s house in Southern California. I just re-discovered my electric fry pan and was inspired to dig out my old recipe card. I actually found it! Here is how I prepared Sukiyaki last Saturday, here in the year 2015. Heat a large electric fry pan to 360˚ (or use a large, flat skillet on your stove top). Add a few tablespoons vegetable oil and fry the meat until brown. Push the meat to a corner of the pan. Lower the heat to 320˚ and add the sauce. 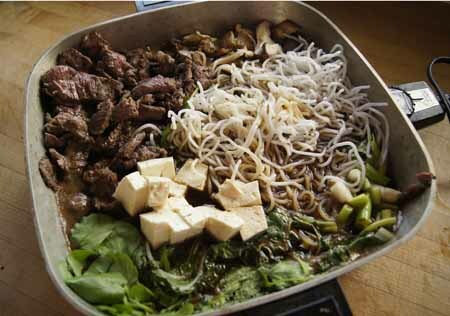 Put the green onions, bamboo shoots, noodles, water cress, mushrooms, and tofu in separate piles in the pan. Continue to heat until all the ingredients are hot. Serve! 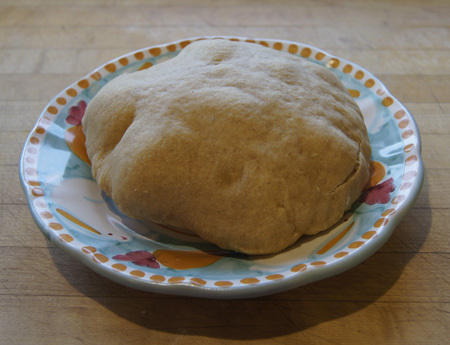 Pita breads are easy to find in stores, but they can be thick or thin or have pockets or not. I like my pitas thin and with pockets. But store ones that are thin and have pockets usually fall apart when you fill them with a lot of stuff. I recently made Beef Steak Pitas for this blog. The thick, pocket-less pita that I bought at a local Mediterranean market reminded me: I can make my own pitas! Sometimes you just have to do it yourself to get it right. I made these last week and they turned out perfect. I enjoy the nutty taste and chewy texture that the whole wheat flour lends these breads. I like watching them puff up in the oven. I love taking out a hot one, cutting it in half, filling it with a slice of cheddar cheese, and ooh-ing and aah-ing at the experience. In 1999, I wrote up my method for pita breads in my old blog (here is the history of that blog). Here is that post, along with my slightly updated recipe for pitas. I was inspired to make these after a member of a news group I was reading, rec.food.baking, asked for suggestions as to how to get pita bread to bake with even crusts. No one else in the group was posting an answer, so I dug out my old recipe (it’s been at least 15 years since I tried these, back when I was baking with more whole grains than I do currently) and gave it a whirl. And yes, I did use a bread machine to do the dough, sorry, but I like the freedom it gives me, plus I’m busier than I used to be. The recipe works just as well if you do the kneading by hand, then let it rise until double, punch down and form the loaves. Mix in bread machine on the dough cycle, monitoring the dough after the first few minutes in the machine, adding a little more flour or water if necessary to keep a nice ball of dough. If you can, leave the dough a little bit wetter than you would for conventional loaves. When the cycle is complete, divide the dough into 10 pieces, knead each piece briefly, then roll each into a 6 inch circle. At this point, you may let them rise until puffy, about 20 minutes. Put a heavy griddle on the bottom of your oven. If you have a gas oven, this really means on the BOTTOM; in an electric oven, you must use the lowest rack (take out the upper rack). 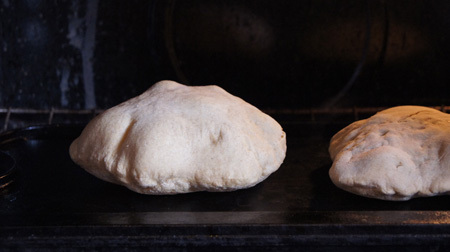 Heat the oven and the grill to 425˚ for at least 15 minutes before you start baking the pitas. Place the loaves on the heated grill, a couple at a time, and bake for 6-8 minutes. They should puff up magically! 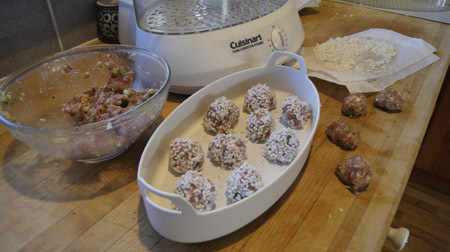 If desired, you can then place them under the broiler to brown the tops. Note: You can use a baking stone instead of a griddle. 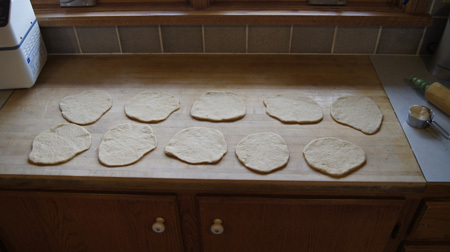 Here are my 10 little pitas, ready for the oven. Here they are magically rising when I opened the oven to take a peek! Here is one of the baked pitas. These actually kept their puffiness and I had to kind of squish them down before storing in plastic bags. 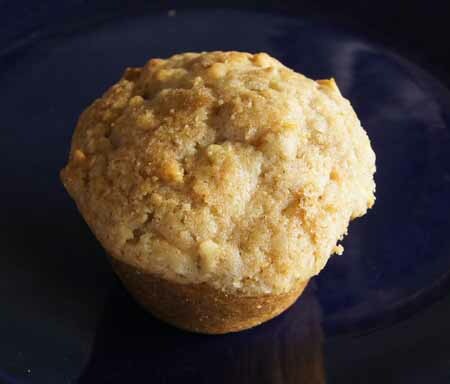 Muffins in the morning! One of my favorite things. 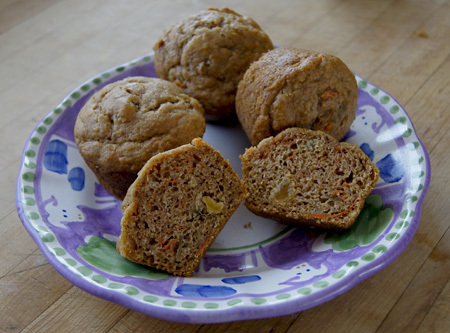 These have apples and carrots and raisins and even some whole wheat flour in them. I often use my own homemade cinnamon-infused applesauce in these. Beat together egg and sugar until light, then beat in oil, milk, and vanilla. Stir in applesauce. Combine flours, baking soda, salt and spices in large bowl. Stir applesauce mixture into flour mixture only until just blended. Quickly fold in carrots and raisins. Put into 12 muffin-pan cups. Bake at 400˚ for 15 to 18 minutes until lightly browned. 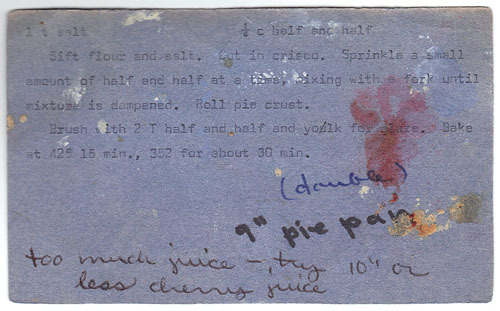 The pie crust recipe that I used for years came from my mother. Hers was always perfect. Mine always tasted great, but was always difficult for me to roll out without tearing. I just lack a certain patience, I guess (well, I know). 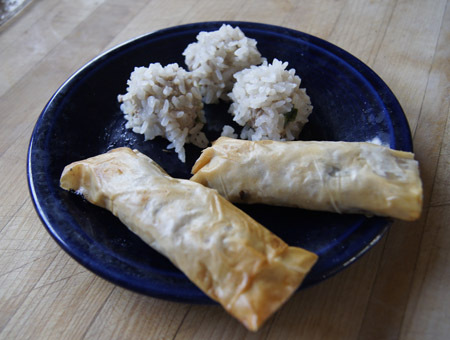 I kept using her recipe out of – well, maybe a bit of loyalty, or an acceptance that they did taste very good in spite of their looks, or maybe a laziness to find a new recipe that worked for me. You mix the flour and salt then cut in the shortening using a pastry blender, sprinkle in enough water so that the dough just holds together, form into a ball, and roll out on a floured cloth. For a double crust, you mix the water with some of the flour first instead of sprinkling it in. My well-used recipe card. 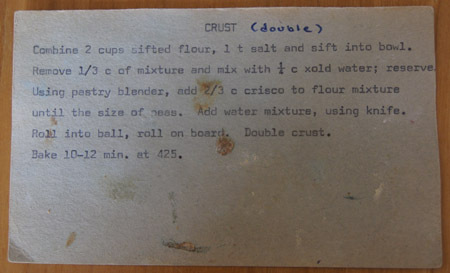 I typed the crust recipe onto a 3×5 rectangle of colored paper when I left my parent’s home. The above recipe is almost exactly the same as the recipe in All-Time Favorite Pies. That one uses a bit more flour and water, but is still a flour-salt-shortening-water pie crust recipe. I never looked forward to making pie crust, it was more like planning for an upcoming battle. Finally, I decided to take on the project of finding a new pie crust recipe. I searched the web for recipes and advice, and tried several different recipes, came on one that worked for me, then nudged the method until I was satisfied with the results. I make about 4 pies a year, so it took me a few years to come up with my final version! 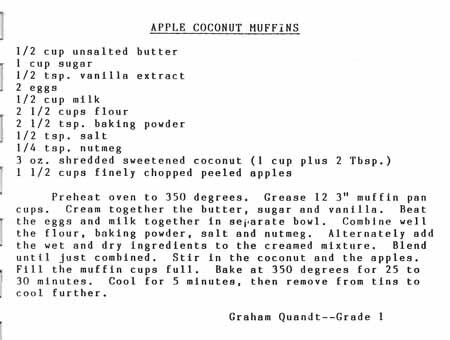 My recipe is heavily based on one I found on Cook’s Illustrated, under the auspices of America’s Test Kitchen (and Christopher Kimball). 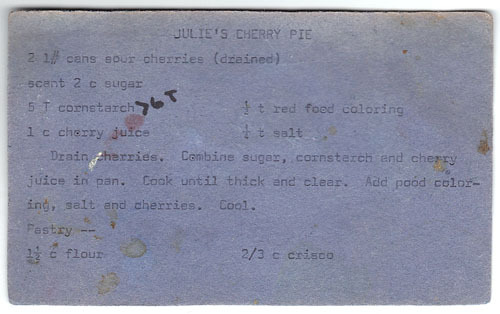 Their recipe title is “Foolproof Pie Dough for a Single-Crust Pie” (dated 2007). I don’t want to step on any copyright toes, and give full credit for the development of this crust to Cook’s Illustrated! My version below just gives a couple nudges that help me make this dough perfect each and every time I use it. The trick to this recipe is: Vodka! Get out your food processor. If you don’t have one, use a pastry blender or two knives instead. But the food processor really, really helps. I have never tried this crust without using a food processor. Put 3/4 cup of the flour and all of the salt and sugar in in food processor and pulse a couple times just to mix. Add all of the butter and vegetable shortening. Process for 10 seconds and check. It should look like “cottage cheese curds” and there should be “no uncoated flour”. If it is not yet to the cottage cheese point, pulse one or two times and re-check. In my experience, largish chunks of butter remaining in this dough are okay. It’s better to under-process than to over-process. Open the food processor and scrape down the sides of the processor bowl. Add the remaining 1/2 cup flour and quickly pulse 4-6 times. Remove the dough from the food processor and dump it into a regular bowl. Sprinkle most of the vodka-water mixture over the dough. Using a rubber spatula, press the dough together until it sticks together and is “tacky”. The exact amount of “tackiness” after the vodka/water is added isn’t terribly precise. The times I’ve tried this, it definitely wasn’t sloppy, and each time had a different degree of “holding together” when pressed against the sides of the bowl. Somewhere between sloppy and falling apart is best. Add the vodka/water slowly and if you add it all and still need more wetness, go with straight vodka. You want it to hold together so it will roll out easily, but too sloppy a dough creates a less-tender crust. If you are a seasoned pie crust maker and the tacky mixture just seems too wet, know (from this chemist) that the vodka will evaporate and by the time you roll it out, it will no longer be tacky. After mixing in the water/vodka, flatten the dough into a 4-inch disk, wrap in plastic, and refrigerate before rolling. In my experience, this crust recipe works mixing together the night before, but take it out of the refrigerator an hour before rolling. It also works mixing the day-of, but make sure you put it in the refrigerator a couple hours before rolling. Roll out on a lightly-floured cloth (like a flour sack cloth). When the crust is large enough to fit the pan, fold the cloth over to fold the dough, then gently transfer to the pie pan and fit and flute. Bake as directed in your pie recipe. It rolls like a dream! Even I can do it!